Home › Economic & Financial News › ETF’s & Smart Beta strategies……..do they work? 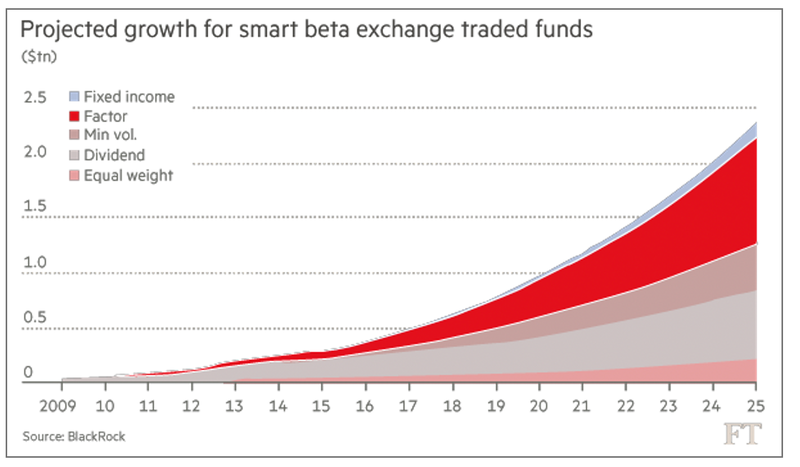 ETF’s & Smart Beta strategies……..do they work? The banking industry has seen a countless variety of marketable assets and securities. The introduction of Exchange Traded Funds (ETFs) has brought a more passive approach to investing, with lower management fees, whilst still being able to be actively traded, on exchanges. The growing popularity of such products means ETFs now form an integral part of our assets at ΓΙΩ Management. Global ETF assets have risen from $800bn to $4.2tn (£3.2tn) in a 10-year period by the end of August 2017. Here we consider the advantages and disadvantages of ETFs to the banking industry. ETFs are designed to track an underlying index’s performance. Therefore, only small adjustments are usually required to bring the ETF back in line with the index if deviations occur. As a result, ETFs have lower management fees, which offers further potential for increased profitability. Also they mitigate the element of managerial risk in comparison with an actively managed fund (known as passive management). ETFs are able to be bought on margin, sold short or held for the long term and traded when there’s a need for liquidity. This increased flexibility along with the potential for increased profitability is why ETFs are now becoming increasingly popular. reduced risk and lower costs by constructing a more dynamic, precise and balanced portfolio. Thanks to ETFs banks can also profit from arbitrage. As market makers and institutional investors, banks have the ability to create a basket of stocks and sell the basket for more than they paid for the stocks in the basket. If either the ETF or the stocks are mispriced, banks can profit by buying the undervalued and selling the overvalued. 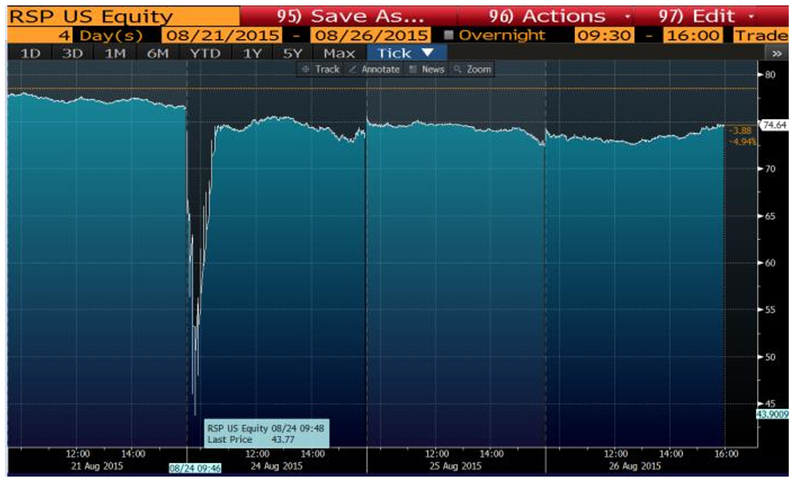 ETFs are vulnerable to turbulent price swings. After ‘The Crash of 2:45’ back in May 2010, regulations were introduced such as market-wide circuit breakers; but in August 2015 these were proved inadequate after another flash crash. During the first 15 minutes of markets opening, there were 1,278 trading halts for 471 different ETFs and stocks meaning it was not possible to calculate the fair value of many ETFs (see figure 2). Technological improvements are needed to refine the trading mechanisms of ETFs. Without this there are likely to be more erroneous and fake trades, which are accepted by the market resulting in another flash crash. As the banking industry experiences more technological advances, there will be a shift towards alternative, smarter investment strategies, such as smart beta ETFs over the traditional vanilla market capitalisation weighted ETFs. We are only beginning to witness how technology has the ability to transform big data into information for investors. These new ideas can heavily impact how the banking industry and in particular, ΓΙΩ Management, strategizes to maximise returns for clients. The market for ETFs is set to grow and there may be increased volatility and more innovative forms of ETFs being introduced. Either way, we will seek to capitalise on any arbitrage opportunities. It is unclear whether there currently exists an ETF bubble; however, ΓΙΩ Management believes ETFs can bring a positive change to the banking industry if closely monitored and supported by new regulations.